Making the right decision on what show to attend can make or break your trade show booth. You want to know your target audience you are looking to reach for your booth and choose a show that will be filled with those types of individuals. The more people that will be interested in your booth’s category will ensure more visitors to your booth. A lot of the time conventions are asking for an RSVP to the trade show so they can compile a list of names that will be attending. This can provide exposure for your booth before it is even set up and help you get to know who else is attending the event as well to help you with your marketing materials and overall pitch. More people are likely to visit your booth if they know for sure you will be attending that show. Promoting your trade show appearance on social media and on your companies website will allow all your loyal followers and customers a chance to make room in their schedule to come check out your booth. It also shows that your company is actively participating in events in their field which is awesome for brand awareness. Giving everyone that passes your booth something to hold on too can add lasting impact on the impression you make at the next trade show you attend. Some of the best handouts available can be ordered and printed at Replica Printing Services. Those handouts include business cards, flip books, pamphlets, and fliers. Most of the people passing by your trade show booth are going to be shy and hesitant to start up a conversation with the person running a booth. That is where your preparation comes in handy, do not be reluctant to stand up introduce yourself and start your pitch to them. That is why they are there isn’t it, so do not be discouraged by people who do not want to engage that is what trade shows were made for. Knowing what you want to say to people who are interested is sometimes half of the battle. If you sound like you are unfamiliar with what you are trying to communicate it might come off as unprofessional and incompetent. So the best way to avoid stumbling while talking is practice practice practice. Before you head to the trade show make sure you have read over your pitch multiple times to yourself and it also helps to pitch to friend or family member to see what they think. Another good way of practicing is getting in front of a mirror and saying your speech to yourself. Most likely you’re not in this alone, unless you run your own personal business, you have employees that are willing to go somewhere different and step out of the workplace for a day or two. Even if you don’t, you can always ask a few friends or family members to come help you out. This comes in handy when large groups come up to your booth at once so they have multiple people to greet them and answer questions. Extra team members also speeds up the tedious set up and take down process of your booth. 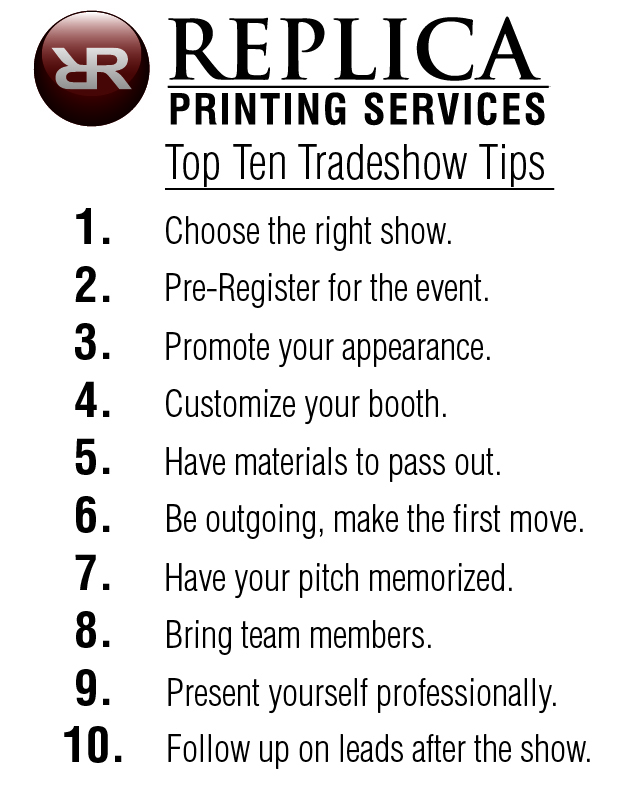 Most of the time your trade show impression will be your first impression with a potential new customer. This is why appearance and confidence is a major help to your booth. You do not want to appear sloppy and unprofessional to potential group of new consumers. Dress to impress and don’t forget to do your hair and wear your best shoes. A lot of the time people get back from their trade show and immediately dive right back to what they were working on before they left for the trade show. This is a mistake, give yourself some time to process what happened while you were at the trade show. What went well? What went wrong? What can we improve on for our next trade show appearance? Most importantly, you will want to contact and follow up with the people who attended your booth that were interested in what you were saying or trying to sell them. Next Post What Can Digital Printing Do For You?